The Nation's oldest capitol building in Annapolis, Maryland. USNA midshipmen in Annapolis,Maryland. Max Hartshorne photos. Outside Magazine conducted an online contest called Best Town Ever 2015. 64 cool towns competed for votes against each other based on these criteria: "great access to trails and public lands, thriving restaurants and neighborhoods and a good beer scene." 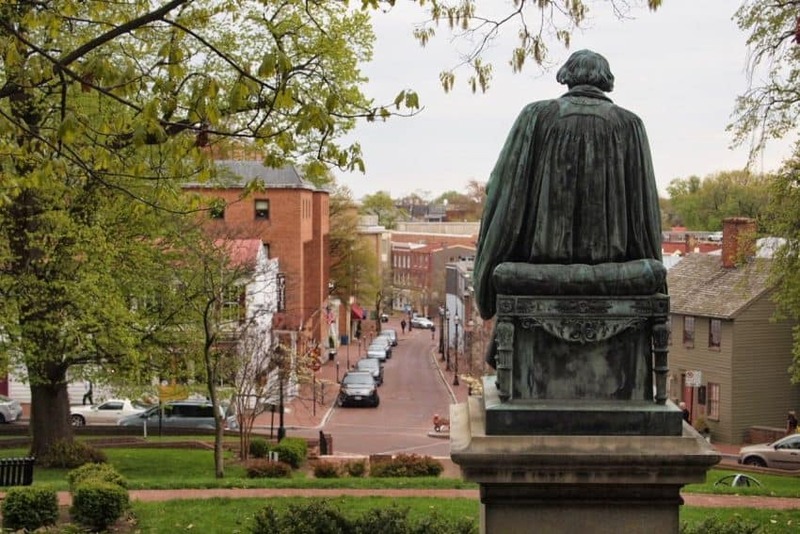 Annapolis Maryland outvoted Northampton, MA. and made it to the third round until losing to Bar Harbor, Maine. Regardless of the voting, (Chattanooga TN won) and given the opportunity to visit Annapolis in May 2015, I jumped at the chance. A whirlwind five days with my friend Max Hartshorne, GoNOMAD editor, gave us a great introduction to this exciting waterfront city. Famed navy captain John Paul Jones tomb below the USNA chapel in Annapolis. Jack Dunphy photo. We hopped on the Amtrak Vermonter in Greenfield, Massachusetts for the eight-hour train ride. We agreed we wish the train went faster. But with the comfortable seats, ability to stretch out, wifi, club car and being dropped off in Baltimore city center we preferred the train to flying. Greenfield, Northampton and Holyoke, Massachusetts in 2015 regained station stops, and we were eager to experience a rail trip instead of going by car. It was a great decision--especially as we whizzed passed the traffic-choked Interstate 95, beside the train's route. The Airport Shuttle whisked us the 30-minute drive to our hotel, Loews Annapolis. My room was spacious, modern and comfortable. I soon headed to the hotel restaurant, Baroak Taproom. Another nice thing about the hotel room was a large desk, and plenty of plugs--writers need these things, and the room was well equipped, along with free Wi-Fi. 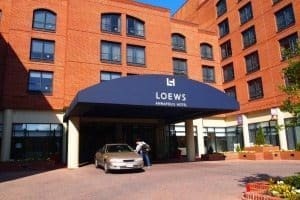 The General Manager of Loews, Barbara McMahon, saw me reading tourist literature on Annapolis and asked me if I wanted any recommendations for things to do. Her kindness set the tone for our whole trip--locals being helpful at every turn. She summed up her love of Annapolis saying "Annapolis is a museum without walls." While Barbara frequently returns home to her native Pittsburgh, she's excited about the buzz that can be felt in this recreational sailboating capital of the East coast. Guide Taryn Small toured us through the United States Naval Academy. It is a strikingly beautiful 338-acre campus on the banks of the Severn River. She rattled off interesting details: The USNA was founded in 1845, closed and relocated to Newport, RI during the Civil War. Inside Bancroft Hall, the large dormitory at USNA where all of the cadets live. It is very selective (1 in 15 applicants accepted). Of the 4,400 students called cadets, 25% are women, every midshipman is in tiptop physical shape, and the whole four-year degree program is free, as long as each midshipman serves in the military for the next five years after graduation. You can feel the patriotism in the air here. Taryn said, "After the new midshipmen arrive they are required as a team to figure out how to scale the 21-foot Herndon monument after it is covered with 50 pounds of grease and retrieve a midshipman's cap placed on the top." Hint: a human pyramid. Personally, I would rent a lift. The midshipmen learn some humility along the way too. In 1982, a Naval Academy (4,500 cadets) Commandant was chatting with a freshman from the other Annapolis college, St. John's (450 students, founded in 1696). The Officer remarked, "Every midshipman exercises two times a day to three hours per day. We can beat you in any sport." The freshman replied, "How about croquet?" An annual tradition was born! St. Johns has defeated the midshipmen in 25 of the last 32 matchups in what is now called "the largest croquet event in the nation." "The Naval Academy graduation ceremony," Taryn said, "ends with each midshipman receiving their naval ring. Before the ring is placed on their finger it is dipped in a bowl that contains water from each of the seven oceans of the world." 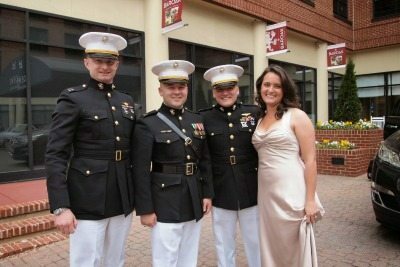 Knowing that every graduate will soon ship out to one unfriendly ocean or another to protect our freedom filled me with gratitude and respect. 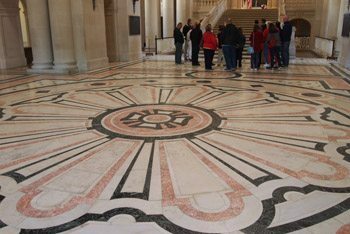 Naval Academy Tours can be arranged most weekdays and are definitely a must-do event in Annapolis. After all that walking at the Academy, it was into the Iron Rooster for lunch. Our table offered a waterfront view. Restaurant Manager Robert Davis was a transplant from Washington, D.C. He clearly felt comfortably at home in Annapolis. Sailboats on the Severn River. "Everyone in DC operates in sixth gear," he said, "and here everyone is in second gear. I prefer second gear." The menu featured seafood, as we would see throughout our tour. Crabs are a big part of many recipes here, in dips, in sauces and of course, served by themselves and a few big mallets to crack them open. Cantler's Crabs or Mike's Crabs were recommended for this traditional Maryland repast. We next connected with Geoff Elliott, owner of Green Pedals bike shop. Geoff specializes in electric assisted bicycles for sale or rent. Never having been on one I felt skeptical. I like to bicycle. Maybe electric assist was cheating? It didn't take long for us to realize that riding electric bikes in a beautiful waterfront trail is never cheating. It's just too much fun! Max, Geoff and I took off on an hour ride around town, on a dirt road along the Severn River, and across the Spa Creek Bridge with striking views of US Naval Academy. We pedaled passed tall abandoned radio towers where firemen practiced rappelling high above and dangling from ropes. Faraj of Capistranos barber shop--time for a real man's shave! We asked Susan Steckman of VisitAnnapolis.org if she might recommend some local people we could chat with about the city. She connected us with Faraj Capistrano, owner of Capistrano's Barbershop. What an excellent suggestion! While getting a haircut and my first-ever barber shave I asked Faraj about his background. "My father is Sicilian, my mother Lebanese, I grew up in Israel and moved to Annapolis four years ago because I like power boating," he said. Somehow that interesting background qualifies him for being a local in Annapolis. Where I come from in New England "local" takes several generations. Farag gently placed one warm towel after another on my face to soften my whiskers. As an added benefit the warmth seeped through me melting away stress. I couldn't help but feel us men deserve this special treatment once in a while. Maryland Avenue has lots of great antiques, vintage clothes and a bookstore. Faraj said that few visitors make it over to Maryland Avenue, where his shop is. But once a man or a group of men experience being shaved, they often are surprised by how nice it feels. We returned to Maryland Avenue later for some shopping in vintage clothing stores, used bookshops and antique stores. It's a rich assortment that's definitely worth checking out! Faraj told us the Galway Bay Irish Restaurant a short walk away offered the best corned beef anywhere. We tested his recommendation and heartily agreed especially when combined with their locally crafted beer. This cozy little restaurant featured a waitress with a true Irish broque, and the corned beef poppers and salmon were excellent! Rams head on stage: An excellent live music venue 7 nights a week. For our evening entertainment, we heard live music at the 350-seat Rams Head on Stage. The place was packed for a band called "Voyage." They played a musical tribute to the popular band Journey. The crowd knew all the songs by heart. Rams Head offers excellent acoustics and everyone gets a perfect view of the stage from nearly any seat in the house. Combine those features with a full bar, big menu, waitress service to each table and live music nightly- now you know another reason Annapolis is in the running for "Outside Magazines" Best Town Ever award. Live music in an intimate venue like this is a real treat! Owner Ted Levitt of Chick and Ruth's Delly served us a heaping good breakfast and demonstrated several impressive magic sleight of hand tricks at our table too. Soon Ted took the microphone and thanked several veterans by name who were eating breakfast for their service to our country. 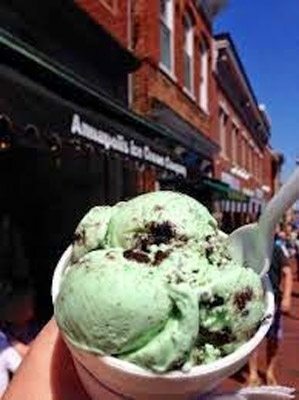 The Annapolis Ice Cream Company. Next, we all stood and as is a daily ritual at Chick and Ruth's Ted led us through a deeply moving recital of the Pledge of Allegiance. You may go to a thousand forgettable restaurants but if you go to Chick and Ruth for breakfast and the Pledge you will never forget it. Since Annapolis is all about the water in the afternoon we looked at the city and harbor from a boat. 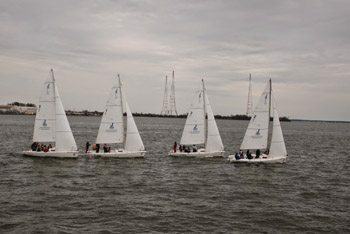 Cruises on the Bay by Watermark took us past the Naval Academy and out onto a cool harbor breeze. The Irish coffee served on board warmed me nicely. I always enjoy the chance to see what a city looks like from the water. Besides a legion of small sailboats, the Severn was busy on this weekend day with other pleasure boats as we cruised leisurely in the river and heard some of the city's history from a guided tour on board. 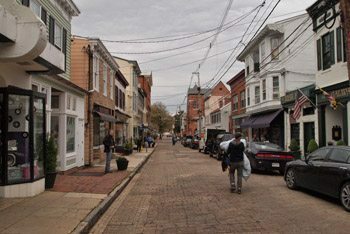 Annapolis, a city of narrow streets and slow-moving traffic, is a walkers delight. People were happily walking everywhere window shopping and looking at the snappily dressed male and female cadets. The women cadets looked especially striking in their long dress uniforms. All that bicycling and walking and looking kept us from strolling past the Annapolis Ice Cream Company. A beautiful aspect of the city are the many old houses. Nancy Giera, the owner with husband Walter, said they left their home in Western Massachusetts 11 years ago and drove up and down the East Coast searching for a warmer and perfect place to live. They found it all in Annapolis and founded a successful homemade ice cream business as well. The line out the door said it all. These two are just another of the many people we met who chose Annapolis for no other reason that it's a wonderful place to live, work and raise a family. Decorated plastic spoons in abundance hang on the walls. When asked why Nancy said, "Rather than throw them out I washed them and hung them on the wall as decoration. When I passed 70,000 spoons on the wall the Fire Marshall made us take most of them down." The Fire Marshall may lack a sense of design but Guinness Book of World Records took notice! 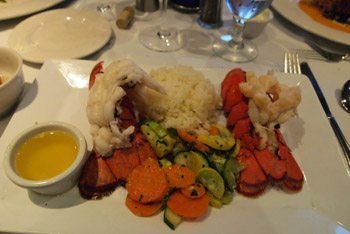 For dinner, We decided to splurge at a fancy restaurant across the River in Eastport. Carrol's Creek Cafe offered upscale ambiance and plenty of views of boats coming and going. While enjoying our fresh baked rockfish, a local favorite, we asked General Manager Richard McClure for some fun facts about Eastport. Richard also said every spring Eastport has a sock burning bonfire. The stated idea here is to welcome the start of boating season but it sounds more like another excuse for oysters, chili and beer. Both events raise money for local nonprofits. Like the Giera family of the Annapolis Ice Cream Company, I too did not want to leave. They started an ice cream business to secure their place here. It seems Annapolis has everything it needs. What can I do? How about a sock store to replace all those burned socks? Go Fund Me, anyone? Find out more about Annapolis at visitannapolis.org, their useful tourism website. 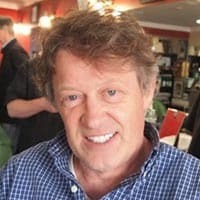 Jack Dunphy is a biker, hiker, paddler and real estate developer who lives in Greenfield MA.